After six years the Republic Forces Radio Network Team is presenting their final episode covering the Clone Wars animated series. Listen as the entire team chimes in on the conclusion of season six and the four episodes that look at the mystery of Sifo-Dyas and the secrect of Jedi imortality! The Republic Forces crew review the third arc of The Netflix Exclusive season six of the Clone Wars and discuss weather or not Mace and Jar Jar should have their own buddy cop sitcom. Is Jar Jar the next action hero in the Star Wars universe? Will he get the girl? Does anyone care? The Republic Forces crew review the second arc of season six of the clone wars and discover if Anakin and Padme have a healthy relationship and how the Republic can afford to pay for the Clone Wars! The Republic Forces crew comes back together to review the first arc of season six of Clone Wars. Join Johnathan, Berent, Nathan, Jen, and Jerry as they discuss this highly anticipated set of episodes! The Republic Forces Radio Network team comes together to review the Clone Wars Movie from 2008. Johnathan, Jen, Berent, and Nathan analyze the movie that kicked off the five seasons and discuss the future of the team. 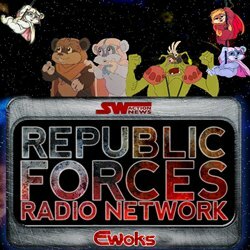 In the last episode of the Ewoks retrospective series, the Republic Forces Radio Network hosts review the final three tales and discuss what some feel is the best Episode in the entire Ewoks series, biker gangs on the forest moon and relationship issues in Bright Tree Village. As we head into the home stretch in our Ewoks retrospective series, Berent, Jerry, Johnathan, and Nathan discuss how to properly babysit woklings, if Latara will ever learn to put her friends before herself, and what to do with a troublemaker on the forest moon of Endor. This week the Republic Forces Radio Network hosts discuss what one of them feels might be the worst episode so far in th Ewok series. Listen in as Johnathan, Nathan, Berent, and Jerry review The Season Scepter, Prow Beaten, and Baga's Rival! The Republic Forces Radio Network crew reviews four more episodes from Ewoks season two, Wicket is presumed dead, Teebo is tempted by the dark side, Kneesa tries to be an entrepreneur, and Latara is a... well it rhymes with witch! The Republic Forces Radio Network crew reviews the next three episodes of the classic Ewoks animated series and discuss why there seems to be a dragon infestation on Endor and how Logray could have ended the battle of Endor in about 5 seconds. All this while trying to stay awake! Republic Forces Radio Network and all content on RepublicForces.com © 2015 and may not be reused without permission. Please do not direct link to any of the content on this web site. RepublicForces.com and Republic Forces Radio Network are not affiliated with Lucasfilm or any other official Star Wars related company. Star Wars and all that the Star Wars Universe contains are © and � Lucasfilm Ltd. All rights reserved. Republic Forces Radio Network is a production of Venganza Media, Inc.